Critiquing a Manuscript? Do it in a sandwich! Are you writing on a desert island? It probably feels like you’re all alone sometimes. There’s only one way to change that. Meeting other writings. Working with them. Critiquing each other’s stories. If you’re like me, you’re the only children’s writer in your circle of “real life” friends. But that doesn’t mean we can’t surround ourselves with other writers – if not in real life, then online. There are so many reasons to network with other kids’ writers! Being around other writers makes me more creative – and I don’t mean stealing their ideas, which I’d never do. It gets my own creativity going and lets me bounce ideas off other real human beings. We all need feedback to make our writing better. Hands down, the best way to get feedback is to SHARE feedback with others. If your feedback is helpful, your own writing circles will expand and you’ll have an even bigger group you can exchange ideas with. And the VERY best way to share feedback is in a sandwich. The feedback most writers are hoping for is known as a critique. Sometimes, people get together in loosely or formally structured critique groups. However you find one another (a topic for another post! ), you must know how to craft a critique that can help other writers without discouraging them. That’s where the sandwich comes in. You simply cannot have a sandwich without bread. And bread, in this metaphor, is… PRAISE. Bread is what lets you hold onto your sandwich, bring it to your mouth, chomp into it. Without the bread, you’re just shovelling loose bits and pieces around. It’s not a pretty sight. But bread also holds the whole thing together. With bread (with apologies if you’re gluten-free! ), the whole thing becomes a single pleasing package. And no, I’m not talking about any fancy open-faced sandwiches, either. I’m talking about the old-fashioned kind – two bread morsels with something delicious in between. So that’s my order: two breads, please. Two big helpings of praise, before and after your critique. Coming back to our metaphor, then, the bread is PRAISE, and the part inside is… CRITICISM. Criticism is the main part of a critique, in the same way that peanut butter is the main part of a PB & J. Have you ever noticed that in a PB&J, there’s way more bread than peanut butter OR jelly? But we don’t call it a BREAD sandwich. Same thing with a critique. You’ll need way more praise than criticism. But without the criticism, you don’t have a sandwich. Usually, criticism comes easily. Finding things you don’t like about a story is usually pretty simple. The hard part is praising the story in a way that’s absolutely true, whether you enjoyed the story or not. I hope I’ve inspired you to come up with a few great ones of your own. Of course, I use these lines for stories I actually do like as well. It’s helpful to have a whole bunch of praise-lines in your repertoire so you can whip them out and actually help others with their stories. It goes without saying that in between your praise, you have to word your criticism in a polite and diplomatic way. To me, that’s always seemed far simpler than coming up with praise that will encourage the person to keep on writing and revising their story even if it has some problems in its current form. Working with other writers, keeping up that connection – it’s just about the most important thing you can do if you’re serious about being a writer yourself. So learning to write critiques that other writers value may be a tough skill to acquire at first, but think of it as a gift you master once and then give yourself over and over again. And as any good baker knows, the secret’s in the bread. Thank you for this important article. It's written so nicely, makes sense and I liked the metaphor as well! As always, I love to hear from you. 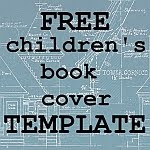 Publish your own children's books with this free DIY cover template. Free Microsoft Word children’s book templates - now in TWO popular sizes, 8.5"x8.5" and 6"x9"! How to get your children’s book illustrated for $5 at fiverr. Is your kids’ book blah or blechhhh? These 10 FREE font pairings add a professional touch. Having trouble choosing a children’s-book writing course? I don’t blame you! Once Upon A Sketch » Once Upon A Sketch – We are a group of illustrators with a passion for the children’s market. How fast can T-Rex run? [Write Kids' Books] See you at SCBWI LA18? Illustrating Old MacDonald Had a…Zoo? It's Not Yet Dark week! Episode 14: Can You Really Make Money With Children’s Books? Confessions of a Kiwi Self-Publisher. What should you name your children’s book?